I get sort of obsessive every so often with certain projects of mine, and just can’t stop making them. 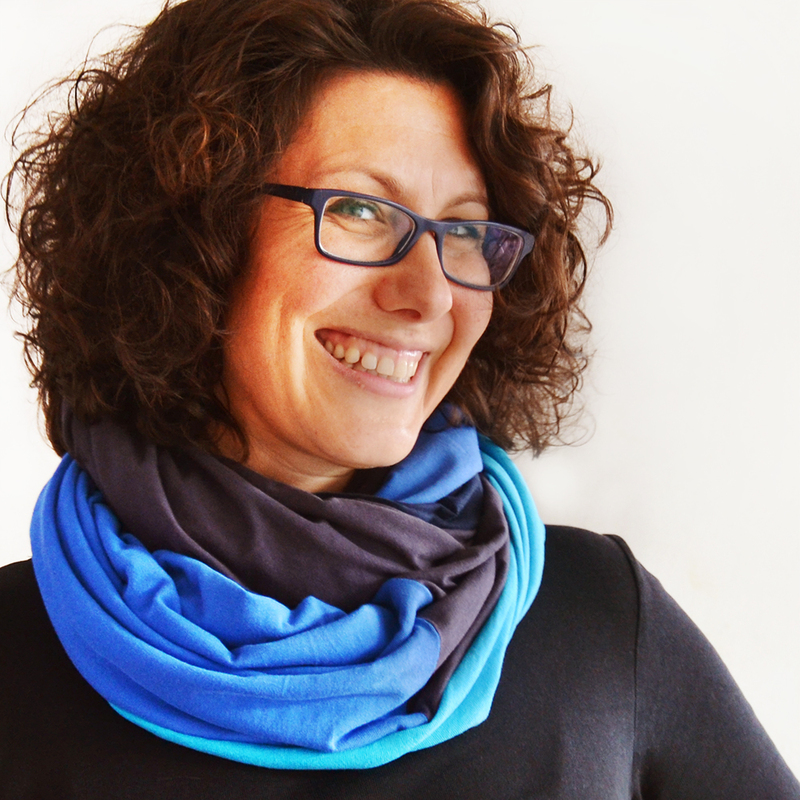 And this is definitely one of those situations, because ever since May 30, 2015, when I made three springtime infinity scarves from refashioned clothes as part of my Me-Made-May challenge, I haven’t been able to stop making them! Seriously, I love infinity scarves (which are also sometimes called “circle scarves”). They can really make an outfit and can have totally different feels depending on which fabric is used in what size. They can be casual or relatively fancy, for warm weather or freezing cold weather. Fuzzy, silky, smooth. With embellishments sewn into them. From brand new fabric yardage or upcycled fabrics. You can really go wild with your creativity! And these make such great gifts! 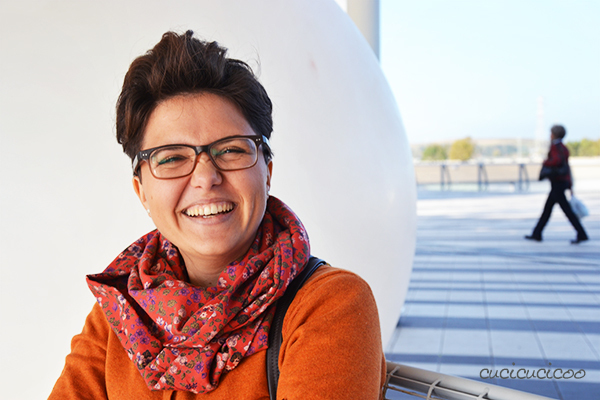 Here is my friend Laura from Le Pecionate when we met up at the Abilmente creative fair in Rome, wearing an infinity scarf that I sewed her. (Isn’t she adorable?) Infinity scarves are very in right now, you can make them to suit the recipient’s needs and tastes, and they’re relatively fast to sew. I’ve been giving different versions of these for months, and have gotten nothing but rave reviews. I actually meant to create this tutorial months ago, but I first wanted to publish a sewing lesson on how to sew the ladder stitch by hand. 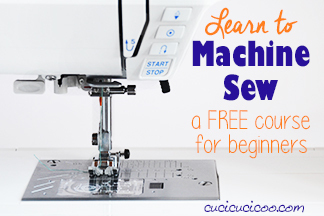 If using a single fabric, all you need to do is sew two seams with the sewing machine, then close up an opening by hand, so I decided to include this project in my Learn to Machine Sew series, even though it is not entirely machine sewn. I’m sure you’ll forgive me! There are no set rules regarding the fabric you use except that it needs to feel nice against the skin and have a nice drape. What does that mean? 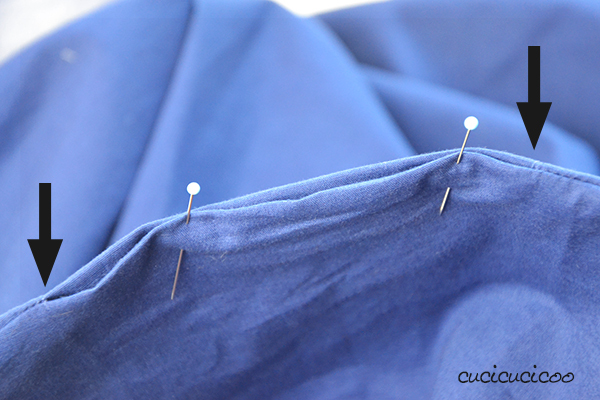 That the fabric needs to be lightweight enough as to not be stiff and to fall nicely when held up. 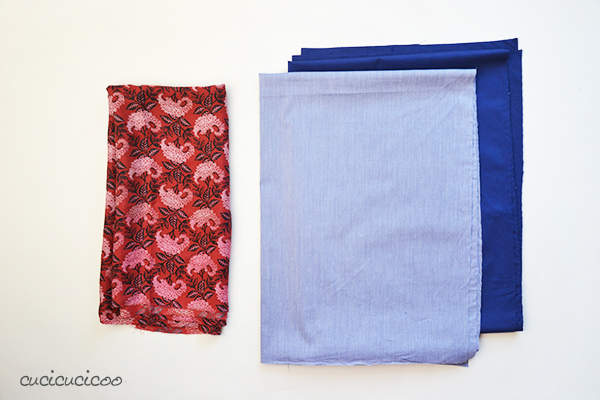 You can also use more than one color or fabric for your scarf. I like the effect that a two-tone infinity scarf makes when wrapped around your neck. I’ve never made an infinity scarf with more than two colors, but I’ll bet it would look cool. Hmm, maybe, just maybe I’ll have to try that out! 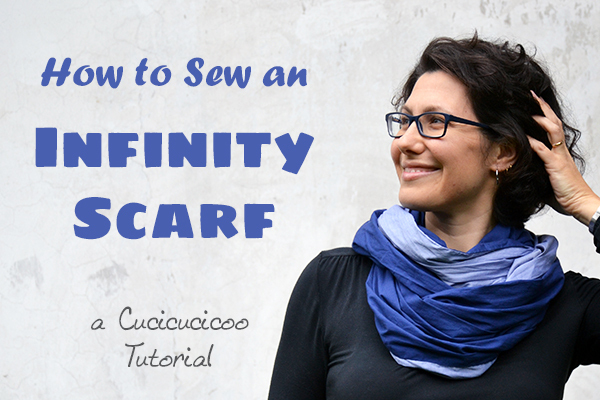 For this tutorial I’m showing how to make infinity scarves from just one piece of fabric, or from two contrasting pieces of fabric. You can really use all different sizes of fabric to make these scarves depending on how tight or loose you want it around your neck and how puffy you want it. If you’re making a scarf from one piece of fabric, cut the rectangle anywhere from 16 – 28″ (40 – 70 cm) wide by 24 – 67″ (60 – 170 cm) long. Remember that the final dimensions will be half those dimensions (minus seam allowance, of course) because the fabric gets folded in half both lenthwise and widthwise. I suggest cutting the fabric, holding the short ends together, and wrapping it around your neck to get an idea if it’s about right or not. 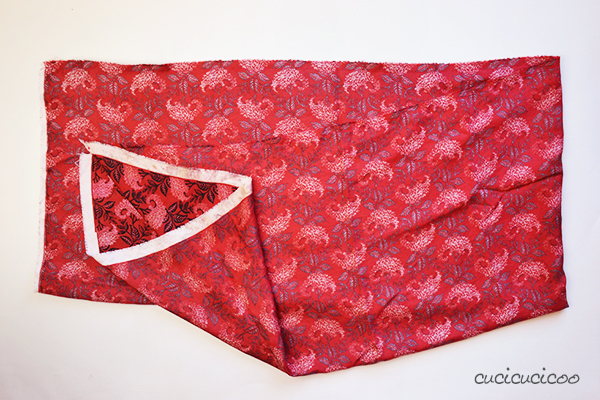 I cut the piece of red silk seen above to 28 x 57″ (70 x 144 cm). 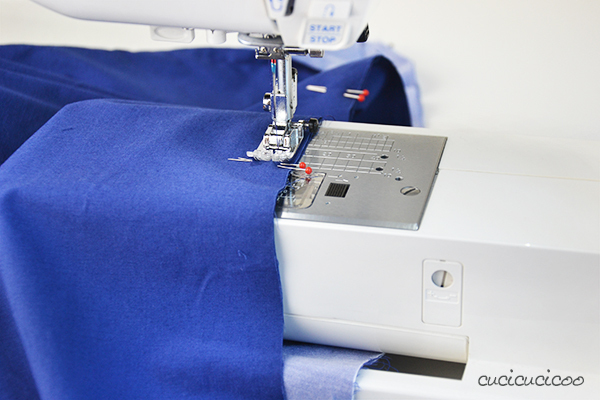 If you’re using two different fabrics, cut the two pieces half as wide, plus 3/4″ (2 cm) for seam allowances. 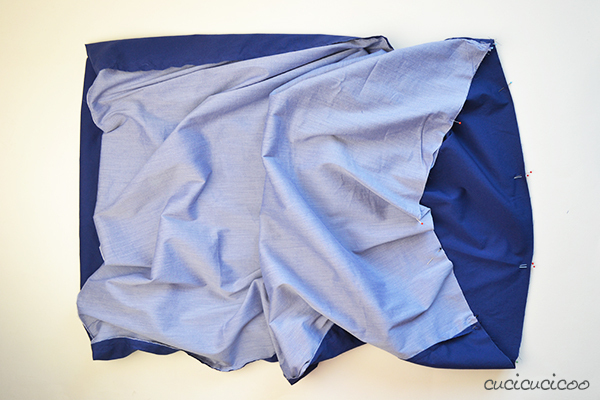 I salvaged the two blue fabric pieces seen above from the simple shawl I’d made for a friend’s wedding a couple of years ago (which you can see at the end of this post), cutting each piece of fabric to 25 x 66″ (63 x 168 cm). If you’re making a spring/summer scarf, I suggest making it smaller. 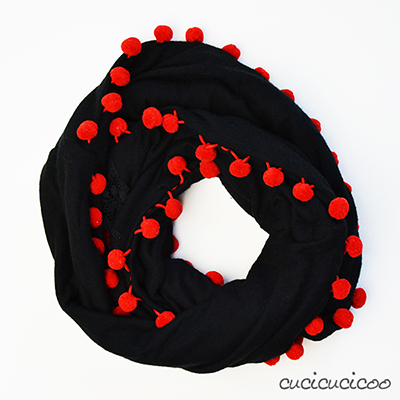 The black scarf with red pom pom trim that you see at the end of this post was made with two 8 x 24″ (20 x 60 cm) pieces. 1. 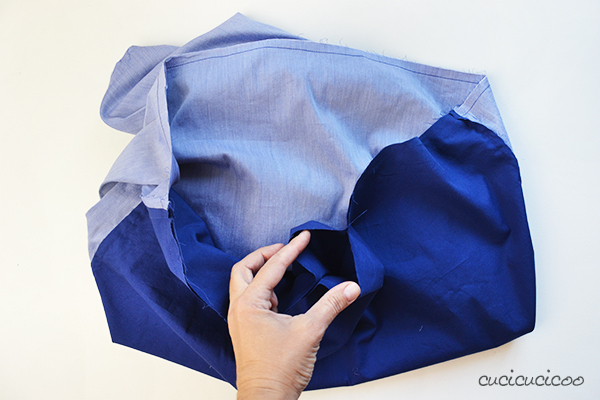 If using a single piece of fabric, fold it in half, lining up the long sides, right sides facing. 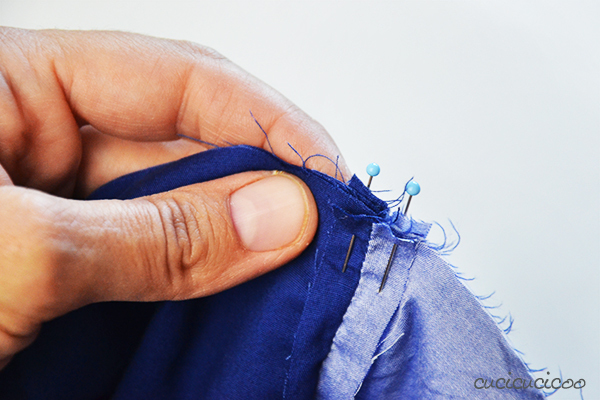 Pin and sew all the way down the side with a 3/8″ (1 cm) seam allowance. You will now have a long tube of fabric. 2. 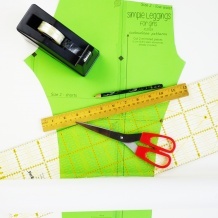 If using two pieces of fabric, place one on top of the other, right sides facing. 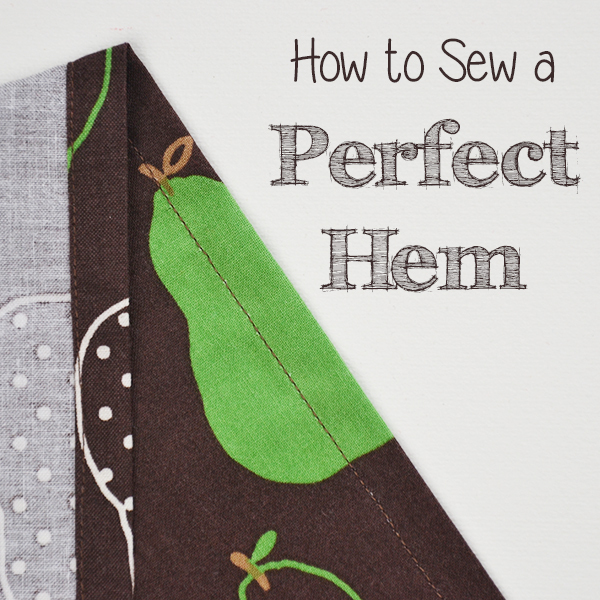 Pin the long sides together and sew down each side with a 3/8″ (1 cm) seam allowance. You will now have a long tube of fabric. 3. Reach your arm inside the tube (which is still inside out) and catch hold of the raw fabric edges at the other end of the tube. Still holding on to the fabric, pull your arm back out until you can match up the two circles of raw edges that make up the two ends of the tube, right sides facing. Pin the edges together. In doing this, you’ve basically created a shorter tube with two layers. This is the trickiest part to understand, although it really isn’t hard at all to do. The geometry of it might not seem to make much sense, but just have faith that it will all work out! Here you can see more closely how the two short edges have been pinned together. 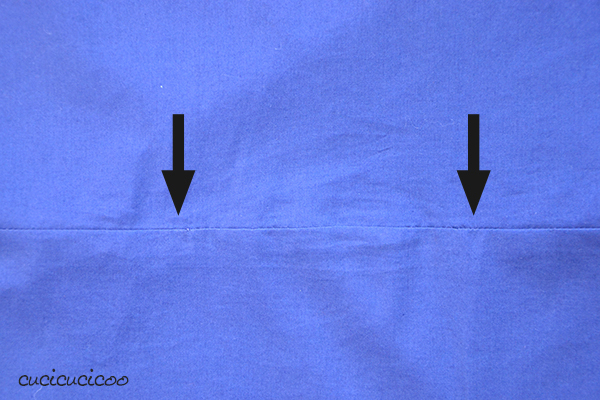 If using two different fabrics, make sure that you’ve lined up the seams, shown here by two arrows. Mark a space about 4″ (10 cm) wide along this edge with tailor’s chalk or by delimiting it with two double sets of pins (as seen above). 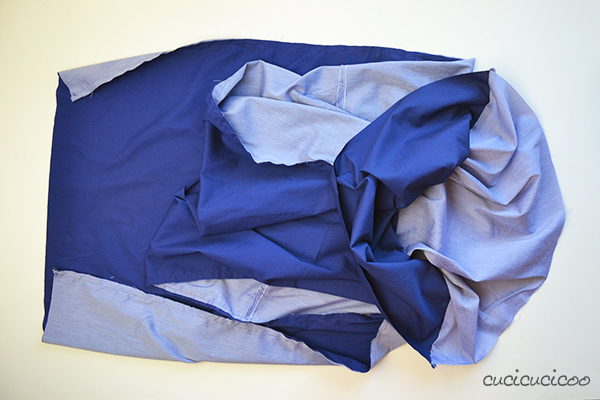 This is where you’ll turn the scarf after sewing this second seam. Iron open the seams before pinning the short sides together. 5. 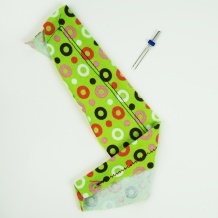 Using a 3/8″ (1 cm) seam allowance, sew all the way around the pinned tube opening, remembering to leave the turning space unsewn. 6. Stick your hand inside the space and grab the fabric at the bottom of the tube. 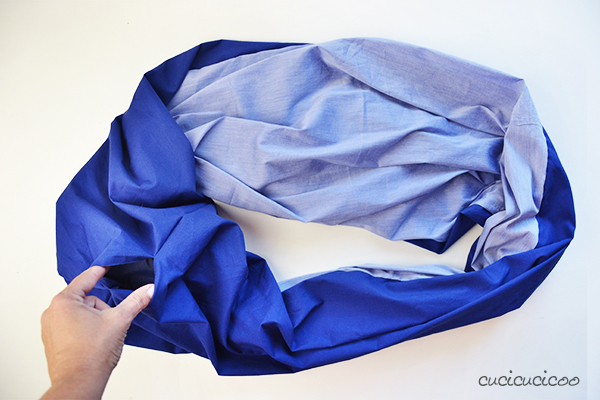 Pull all the fabric out through the space so that you end up with a circular tube with right sides out. 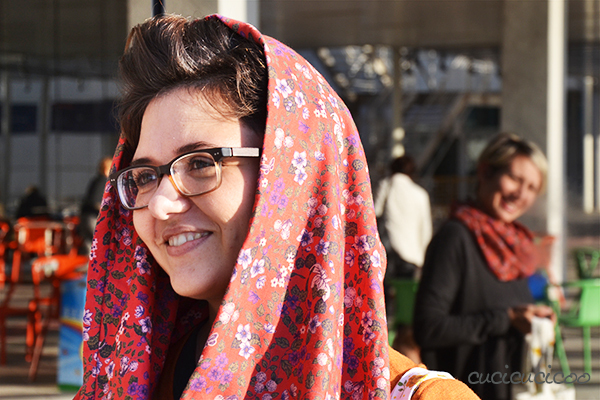 Try the scarf on to make sure that it’s the width and length that you want. If necessary, turn it back wrong side out and sew it smaller. 7. 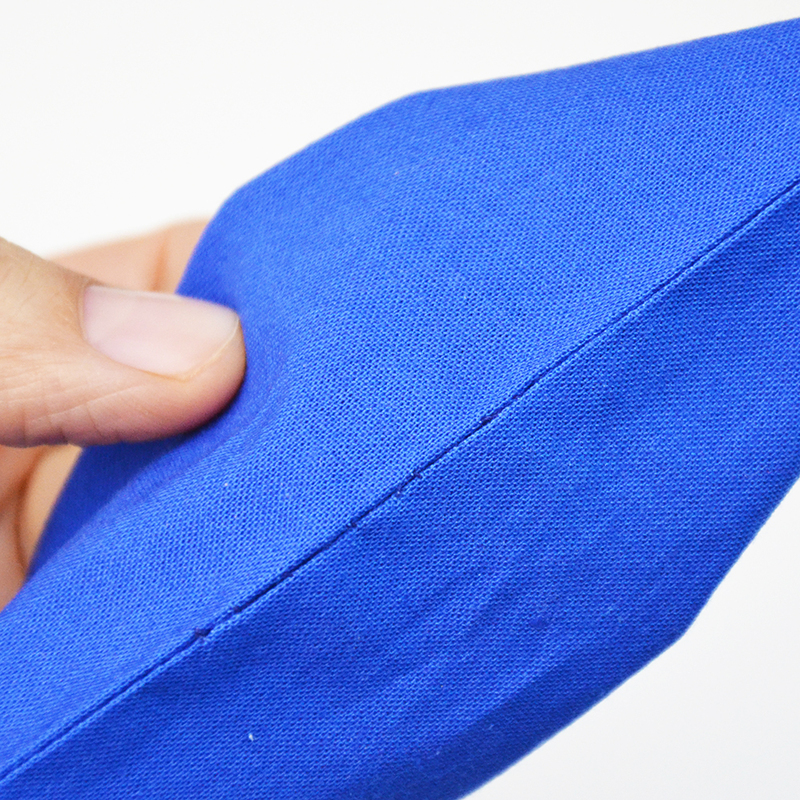 Fold the edges of the opening inwards so that it creates one smooth edge. Iron it (I clearly didn’t iron for this example, but you’ll get better results if you do) and pin the edges together. 8. 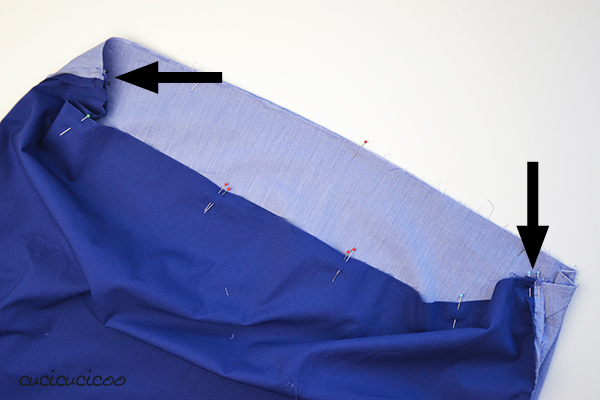 Use the ladder stitch to sew the opening closed. Take a look at my ladder stitch tutorial to find out how easy it is! You can hardly see where I handstitched the opening here (between the two arrows). And that’s it! This is one case where I suggest NOT ironing the end product. I personally find that infinity scarves look better when puffed out and slightly scrunchy, because of the extra volume. Now just wrap it around your neck two or three times (depending on how long you made it) and enjoy the extra warmth and style! When I wear my two-tone scarf, I also like to shift the seams joining the two colors to the center so that both colors are visible when twisted around. 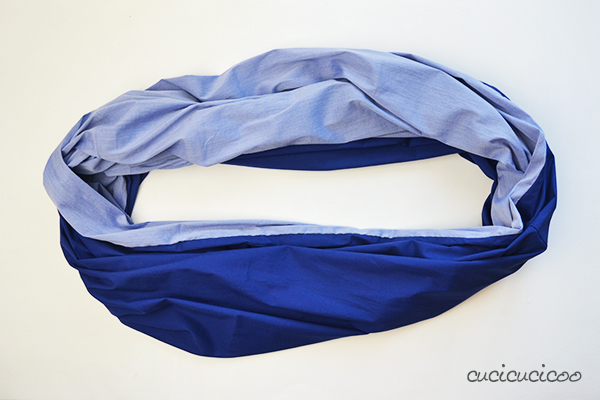 I love the feel and elegance of the silk circle scarf! When I was getting Christmas gifts ready this year, I got this lovely cut of loosely-knit white sweater fabric at my local market for a steal. You can’t tell from this picture, but one side has longer fibers, making the fabric super fuzzy and warm. 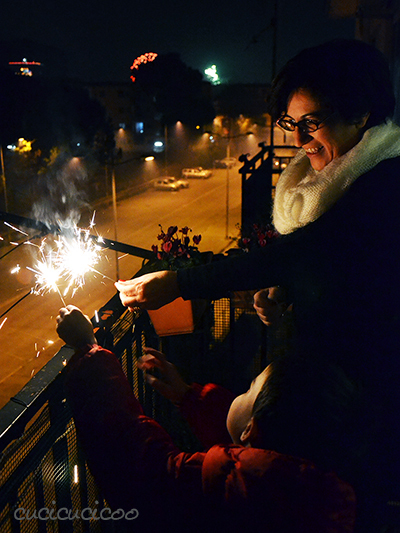 I turned this one cut into four infinity scarves, one of which you can see here on my sister-in-law, as she celebrates the New Year with my little boy. Because the knit is quite stretchy, it’s possible to twist it around the neck three times, making an incredibly cozy neckwarmer. And don’t feel that you can only wear these scarves twisted around your neck. 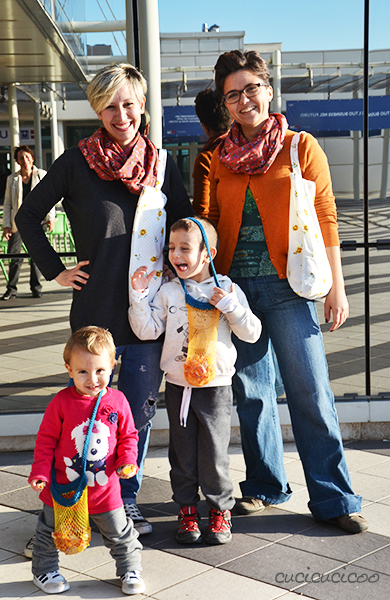 You can also wrap them around your shoulders as a capelet, or loop it over your head as a hood, as Laura shows us here! 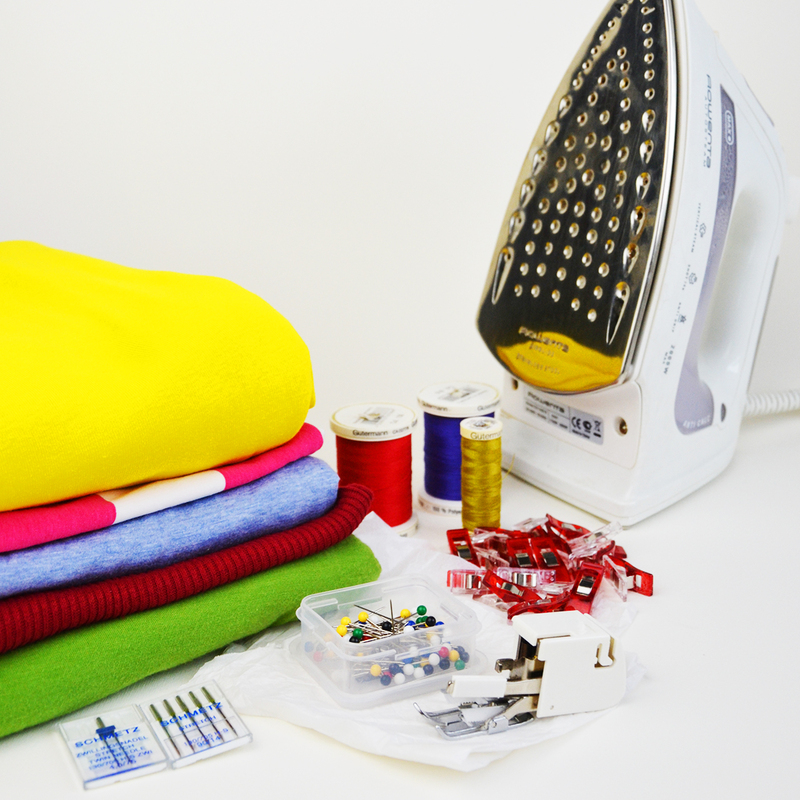 Once you know how to make infinity scarves, you can get really creative. I refashioned an old shirt into this Spanish-style scarf and inserted some pompom trim between the long edges when sewing them together. I love the pop of color the red pompoms give to an otherwise dull accessory! This scarf was conceived of as a spring accessory, and is therefore relatively short and narrow, but it looks great with a sweater or cardigan layered over it, too. I’ve made others, too, that I’ve given away and don’t have pictures of, but the examples I’ve shown here give a pretty good idea at how versatile this technique is! 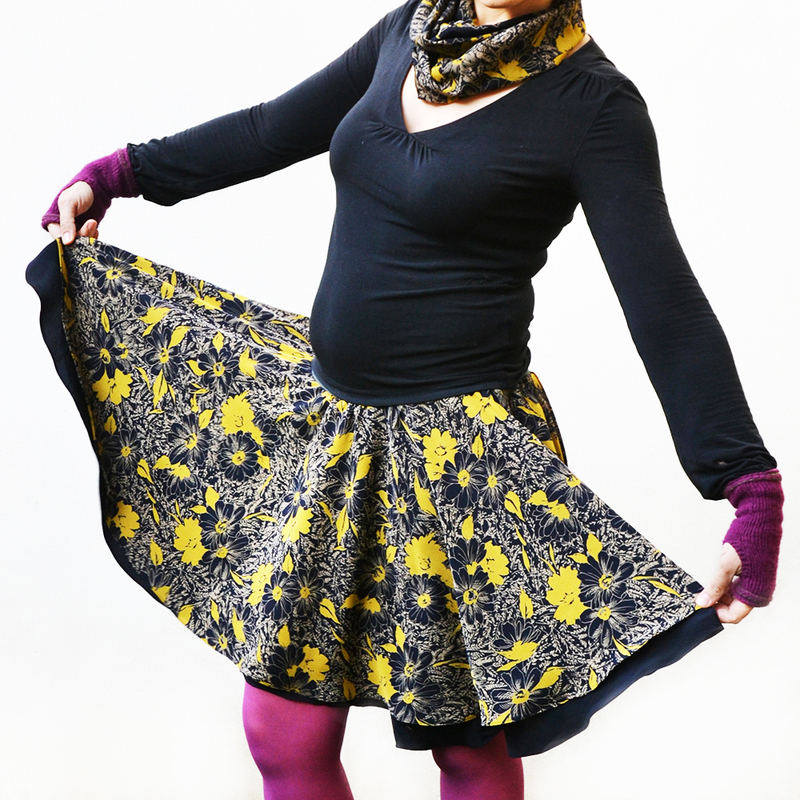 What do you say, would you be interested in a second tutorial showing how to refashion shirts and other clothing into circle scarves, perhaps even how to insert trim like in this last version? 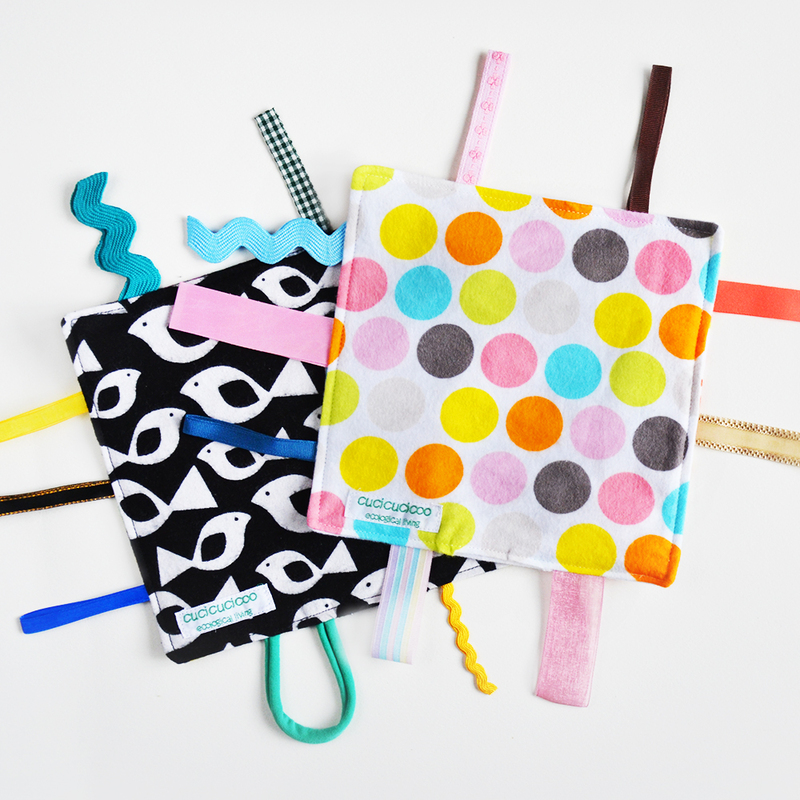 Now whip up a bunch of these super easy and fun accessories! They make fantastic gifts that can really be customized in so many ways! 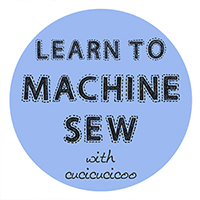 And as always, don’t forget to share pictures of your work on the Cucicucicoo Facebook page or in the Cucicucicoo Creations Flickr Group! 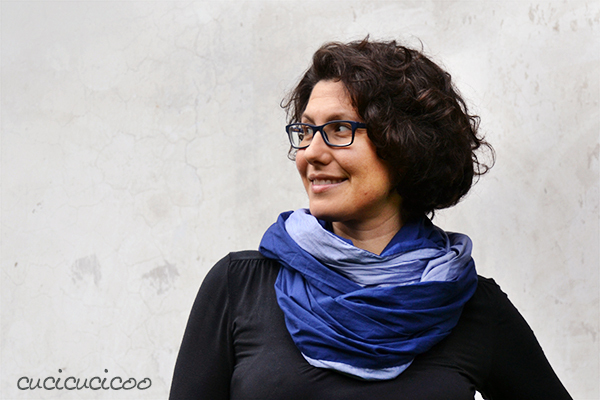 This tutorial on how to sew an infinity scarf is part of the syllabus of Cucicucicoo’s beginner’s sewing course! Previous articleThree DIY flower brooches – no sew! 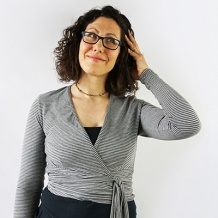 Trovo qsti scaldacollo bellissimi e riciclossissimi,bravissima come sempre e attenta allo spreco, per me che ho problemi di cervicale sai …….. sono utilissimi!!!!!!!! 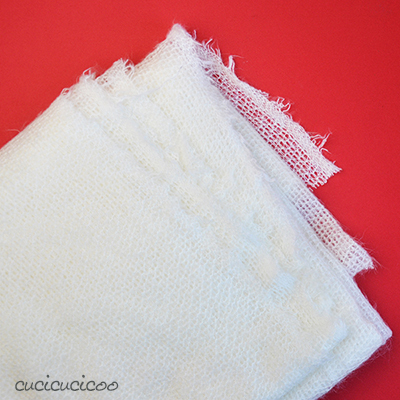 Mi farebbe molto piacere vederne altri , con tessuti riciclati come gonne,maglioni o altri tessuti usati.Aspetto il tuo prossimo tutorial !!!!! Ti auguro buona giornata . Non soffro di cervicale, ma detesto un collo freddo, quindi sono assolutamente d’accordo con te sulla loro utilità! Sicuramente farò l’alto tutorial con i tessuti riciclati perché diverse persone hanno espresso interesse, cose che mi fa tantissimo piacere! Buona gionrata anche a te, Marea! Che vuoi insinuare, Ile, che il tutorial non è la parte migliore?! Haha! Scherzo, ovviamente! Mi sono divertita un sacco raccogliere le diverse foto con le diverse modelle! è un peccato che qualche modello mi mancava. They look fab. I especially love the pom pom trim. It really suits you. Thanks, Linda! I just love pom pom trim. It adds an element of fun to anything! Invece oggi mia figlia è andata a sciare per la prima volta quest’anno (noi stiamo in montagna, ma qui c’è pochissima neve), ho guardato il suo tristissimo “collo” di pile regalatoci un Natale di qualche anno fa dal bar di cui siamo clienti 😆 e mi si è accesa una lampadina: e se gliene facessi uno? La mia domanda è questa: non lo farei a sciarpa ma più stretto perché è più adatto per sciare e le permetterebbe di chiudere la cerniera della giacca fino in cima. Vorrei fare un lato di pile (ho una sua vecchia vestaglia da casa che non è regalabile a nessuno perché in pessime condizioni) e l’altro lato… boh. Forse sarebbe meglio di maglina, (ne ho viste di molto belline e colorate in negozi inglesi), così sarebbe stretch come il pile e quindi più facile da infilare. Oppure del semplice cotone fantasia e in questo caso la dovrei fare un pochino più larga per far passare la testa. O potrei farlo aperto e chiuderlo con dei bottoni automatici (ho la pinza per quelli di plastica che i usano per assorbenti e pannolini). Tu cosa mi consigli? 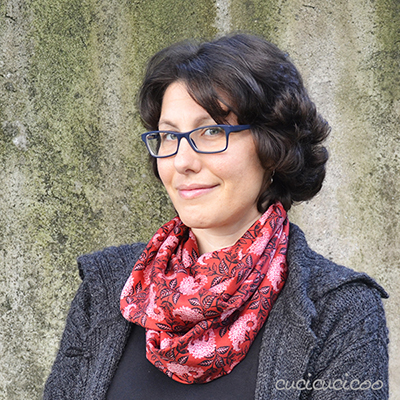 E soprattutto, i tutorial che ho letto su un sito americano (designsponge.com) e uno canadese (http://www.canadianliving.com/blogs/crafts/2015/01/20/neck-nothing-diy-fleece-lined-cowl/ – molto interessante la forma “a bavaglino” per riparare meglio dal freddo – i canadesi se ne intendono!) dicono che bisogna fare attenzione a mettere il pile per il verso giusto, cioè con la parte che si allunga nel lato lungo (non so se mi sono spiegata!). Ma se io uso del pile riciclato come faccio a capire da che parte si allunga? Scusa la domanda da principiante, ma ho provato ad allargare la stoffa con le mani e a me sembra elastica in tutti e due i sensi! Grazie e scusa la lungaggine! Benissimo, Cri! Certo che puoi usare questa stessa tecnica per fare un collo. Basta tagliare i pezzi meno lunghi. Io direi di usare il collo “triste” per regolarti con le dimensioni. Considera che bisogna aggiungere 2 cm di lunghezza alla circonferenza del collo, e di nuovo 2 cm all’altezza, per i margini di cucitura di 1 cm (oppure il doppio del margine che vuoi usare). E poi taglia due pezzi a quelle dimensioni. Io consiglierei di non usare gli automatici per il collo perché potrebbero dare fastidio nel freddo o schiacciato contro la pelle sotto la giacca. Ma bisogna fare molta attenzione che entrambi i tessuti usati hanno una bella elasticità, altrimenti non possono allargarsi abbastanza per passare sopra la testa. Sì, è molto importante che il lato con l’elasticità maggiore sia nel senso della lunghezza. Ci sono diversi tipi di pile con elasticità diverse, alcune in solo due direzioni (in orizzontale) e altre in quattro direzioni (sia in orizzontale che in verticale). Potrebbero essere uguali, ma di solito c’è ne una più elastica. Se non noti una differenza quando allarghi la stoffa, controlla ad occhio. Di solito si vede un minimo di trama/ordito nella stoffa. Se vedi delle “colonne”, quelle vanne nel senso verticale, quindi l’altezza. Nel caso della vestaglia, il senso di elasticità maggiore dovrebbe essere intorno al corpo e intorno alle braccia (cioè, non in verticale), ma controlla prima di tagliare. Molto interessante quel collo con il “bavaglino”…. ottima idea! MAGLINA! OH! Odio il correttore automatico! Non c’è bisogno che tu mi risponda: ho provato il tuo metodo della carta velina che hai descritto nel post sul PUL e funziona perfettamente! Ho provato punti diversi su uno straccio ricavato da una vecchia maglietta e non ho avuto nessun problema! Grazie del consiglio! 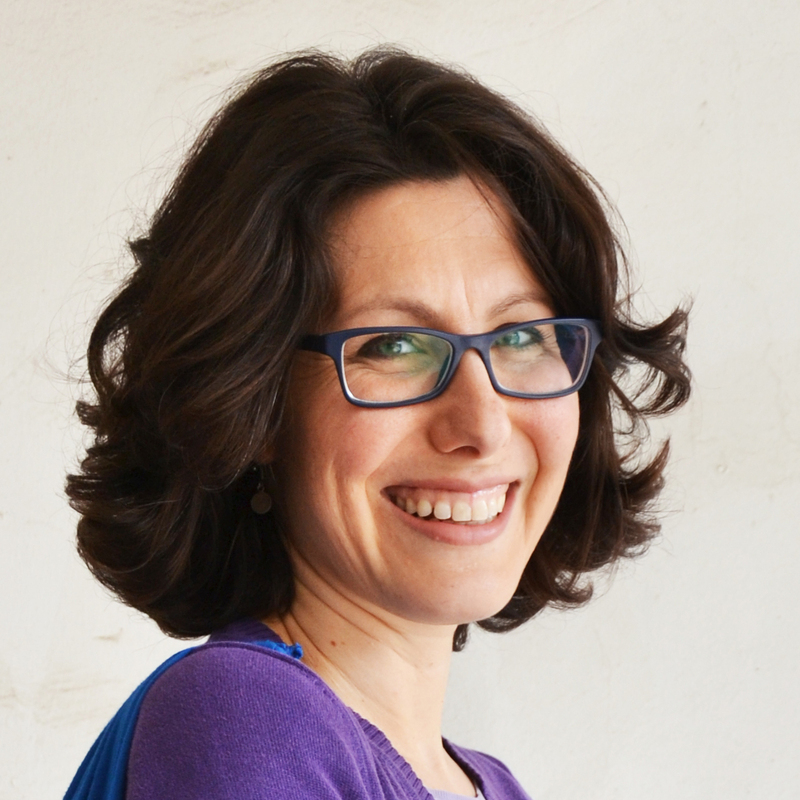 Un’ultima domanda: dovendo cucire insieme due tessuti diversi: pile e maglina è meglio usare l’ago normale o quello stondato per la maglina? Io oggi ho fatto le prove con quello normale, visto che si trattava di uno straccio e non mi importava che si bucasse, ma certo non vorrei che succedesse su qualcosa da indossare! Haha! Detesto il correttore automatico anch’io! Looking good, Lisa! 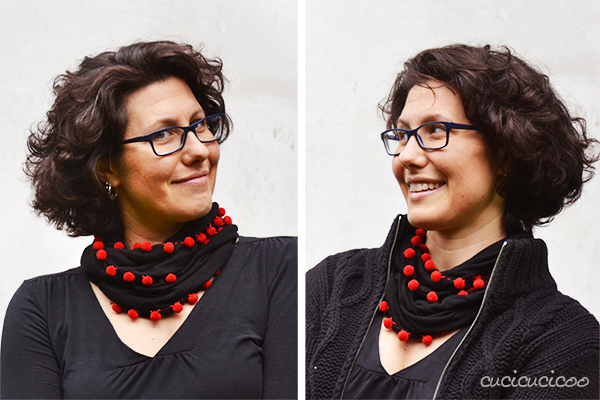 I would never have thought to put pom poms on a scarf, but in the red and black combo it works so well. I like all of your scarves, but my favourite is the two coloured blues. I love infinity scarves, too. Lisa cara, dove trovo il …segreto della carta velina di cui parla cri ? Ti spiego: volevo fare una sciarpa com una maglina un po’ vellutata, interamente stampata con quadri di Klimt. Un amore a prima vista, e ho comprato tutta la rimanenza, tre metri e mezzo alta 150. Appena l’ho presa in mano non sapevo neppure come tagliare ( io sono un mezza frana anche con il cotone, figurati con questa stoffa scivolosa e sfuggente). Ho provato a bloccare i lati corti con il nastro di carta, ma mi pare che neppure si stacchi. Caso mai dai lati corti taglio un centimetro, ma come potrò cucire un metro e mezzo di lati lunghi senza fare pasticci? Prima di procedere ho deciso di scriverti per un SOS. Grazie per la tua affettuosa disponibilità. Ciao Sissy, il trucco della carta velina si trova qui: http://www.cucicucicoo.com/it/2015/02/come-cucire-il-pul-tessuto-impermeabile/ Io l’avevo consigliato per cucire il PUL, un tessuto laminato che si attacca al piedino, e quindi la carta velina fa scivolare sotto il piedino. L’altra cosa che potrebbe esserti utile è il piedino doppio trasporto (http://www.cucicucicoo.com/it/2015/02/come-usare-il-piedino-doppio-trasporto/) . Domani cercherò dì essere più chiara. Grazie e buonanotte. Eccomi Lisa, prenditela pure con comodo per rispondere, perché mi metterò all’opera solo la settimana prossima. Sui lati cimosa c’è un’ampia cornice quindi potrei cucire un po’ lontano dal bordo e poi tagliare l’eccedenza. Il problema è il metro e mezzo di lato lungo in cui dovrei cucire dritto restando nel margine canonico di un centimetro. Io dopo un po’ comincio ad andare storto anche se ho provato mille accorgimenti, piastre magnetiche e chi più ne ha più ne metta. Ho scopero che è un problema comune ai mancini e ai destri forzati, ma questo è un altro discorso. La mia idea era: attacco il nastro di carta su tutta la lunghezza, così blocco i lati, e cucio avendo come guida il nastro di carta. Ti sembra folle o pensi che potrebbe essere una soluzione? Provo a mandarti qualche foto al tuo indirizzo e mail, e ti prometto che per un po’ non ti disturberò. Sì! Allora hai capito benissimo il modo di pensare migliore per il fatto a mano, di trasformare errori in un pregio! Vado subito a controllare la posta! Grazie Lisa, I am SO doing this! è una vita che voglio riciclare le magliette dei bambini facendo una sorta di sciarpa ‘collage’… ti farò sapere! Mi piace “sciarpa collage”! Posso prendere questo nome e usarlo? Te lo chiedo perché il mese prossimo ci sarà finalmente il nuovo tutorial su come farle dalle magliette!